These Wilderness Woodland Forest Animals Wall Plates are sure to compliment any Woodland Forest Themed Childrens, or Nursery Wall décor. The Forest Animal images are printed directly on the Metal switch plate and are easy to clean and durable for years of use. 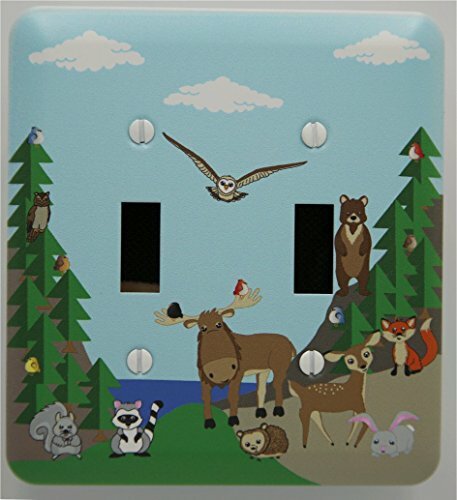 There are several Forest Animals on these Switch Plate Covers. There are Owls, Birds, a Fox, Bear, Squirrel, Deer, Hedge Hog, Moose Rabbit and a Raccoon set on a Woodland Forest scene with lake and Pine Trees in the background. The images are printed directly on the white Durable Metal Switch Plate with inks that are lead free and fade resistant and are easy to clean with a damp cloth. Original Woodland Forest Animal artwork, designed and manufactured by Presto Chango Decor to match our other Forest Animal Nursery Wall Decor Products. If you have any questions about this product by Presto Chango Decor, contact us by completing and submitting the form below. If you are looking for a specif part number, please include it with your message.